Turn to our Mystery Case Files: Fate's Carnival Walkthrough as you, the Master Detective, tackle your most challenging case yet, freeing the prisoners of the renown Fate's Carnival. Trust in our gorgeous custom marked screenshots, our step-by-step instructions, and our easy puzzle solutions to see you through this harrowing experience as you set forth on the task Madame Fate has charged you with. Well, it's not the ideal Thanksgiving situation. I'm sitting in an uncomfortable hospital chair watching the Thanksgiving Day Parade with my husband, sipping some red velvet latte's from Dunkin Donuts (I'm from New Jersey... we don't do Starbucks). Okay, you know what, it's not that bad. He's feeling pretty good considering they are pumping poison into his veins and he even ate the breakfast I brought him... and, as I sit here looking out at a crystal clear, frosty Florida morning, I realize I have a lot to be thankful for. Cancer isn't something that you're ever going to be ready for. It's not something you can plan for. You just have to learn to roll with the punches and keep on swimming. So I'm thankful today for great doctors, kind nurses, and a treatment that will hopefully make this time in our life just a small blip of darkness that will make us appreciate what we have all the more. Anyhow, enough of that and on to more entertaining and exciting topics....like how about that new Mystery Case Files game, huh? Big improvement from the last game we had to slog through, wouldn't you agree? Mystery Case Files: Fate's Carnival is truly a masterpiece, serving up the thrills and chills needed to resurrect this popular franchise after the confusing Shadow Lake dished out last year. 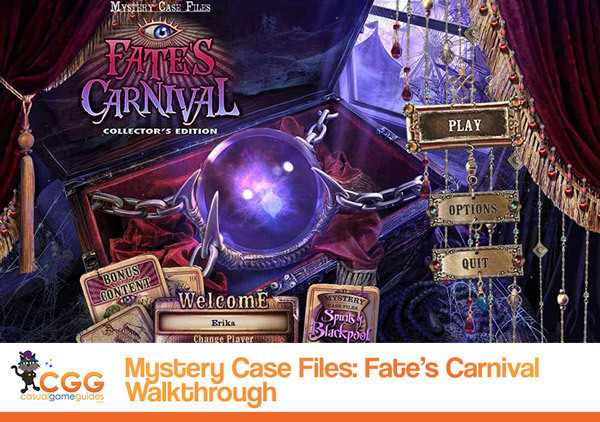 And to help as you lose yourself in this amazing adventure, we've already compiled a Mystery Case Files: Fate's Carnival Walkthrough! 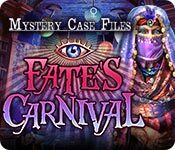 Our Mystery Case Files: Fate's Carnival Walkthrough includes everything you'll need to solve this mysterious case as you and Madame Fate's faithful cat, Isis, explore the grounds of Fate's Carnival searching for the cursed prisoners in need of rescuing. We've included detailed, step-by-step instructions from start to finish as well as tons of beautiful screenshots, custom marked with all key locations and items highlighted. We've also thrown in easy-to-follow puzzle solutions for all the many mini-games you'll encounter as you play this exciting hidden object adventure game. So get ready for a Mystery Case Files adventure that will have you remembering why you love this series so much! And, when the weight of Madame Fate's curse is to heavy to bear and you don't know which way to turn, don't forget to check in with our Mystery Case Files: Fate's Carnival Walkthrough to see you through the fierce challenges.